Brent Reitter focuses his practice in consumer financial services and commercial litigation. Mr. Reitter is experienced in all phases of the litigation process from case inception through trial and has represented insurance companies, insureds, corporations, and individuals in copyright actions, personal injury actions, and product liability actions. Mr. Reitter joined Hinshaw & Culbertson LLP in September 2016. Prior to joining Hinshaw he was an associate at Nicholas Goodman & Associates, PLLC, and an Internal Employee Discipline Investigator with the New York City Department of Correction. 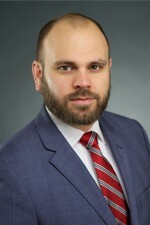 During law school, Mr. Reitter served as an intern with the New York City Department of Investigation, New York City Law Department and Montagu Law, P.C. He also served as a student writer at New York Law School's Center for New York City Law.